The Cumberland & Dumfriesshire Farmers Mart P.L.C. 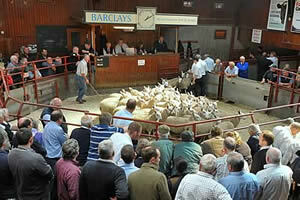 had forward 6,190 Store Lambs at their weekly sale at Longtown on Tuesday 21st September 2010. Another great show of lambs easily maintained late high rates and were good to sell. Top of £70 for Texels from Rinnion Hills, others £67.50 East Stobbylea, £63.50 Quarryfield; Suffolk £65 and £60 Thomasdene, £63.50 Allenhead; Greyface £59.20 Toll Cottage, £57 Low Stokoe, £55 Hammershields and Lossitt; Beltex £58.20 Sharplaw, £56.50 Hillside; Cheviot Mule £55.80 High Tirfergus; Bleu d’Maine £54 High Barns; Blackface £53.50 Sewing Shields, £52.50 Lamperts, £51.50 Townshield; Charollais £53 Townfoot Eals; Zwartbles £52.50 Hillside; Lleyn £50 East Murton; Swaledale £40.20 Howburn. Cast ewes to £76 Bluebell, hill types £60 Bradley. Hill Cheviots (1,585) met a fast selling trade with late high rates being maintained. Top of £55.50 and £55 from Cooms, others £54.50 Toftholm, £54 Bradley and Glendinning, £53.50 Girnwood.